The gelcoat on a boat is an outermost layer on the hull of a vessel. Through epoxy, a polyester resin, a catalyst and other chemicals, it provides water-resistant properties. 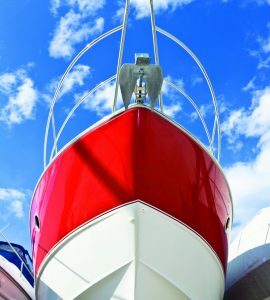 Gelcoat combined with fiberglass produces a strong and smooth surface, preventing the hull of the boat weakening. 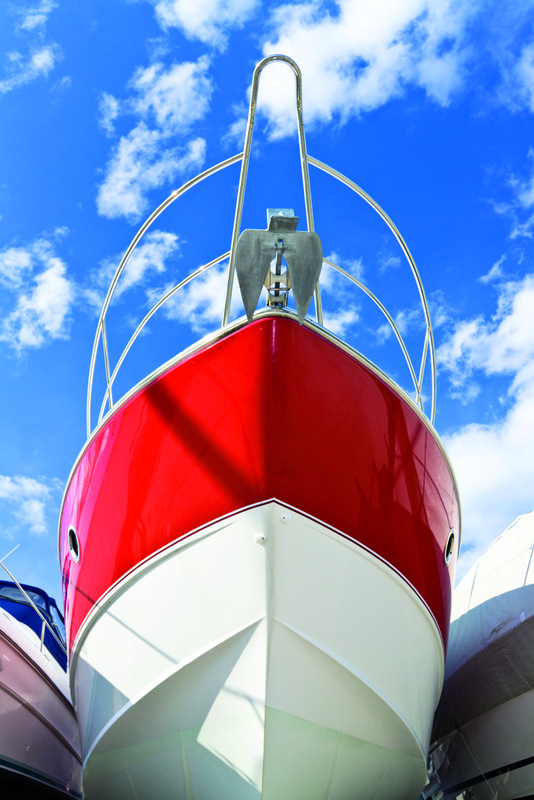 Over time the gelcoat on your boat may start to look old, worn and faded. This is due to oxidation. The marine environment has slowly eaten away at the gelcoat, creating small chips and scratches and the UV exposure from the sun has faded it. This inevitably leads to the gelcoat losing its shine. There are circumstances where you can restore the gelcoat to its former glory by using a product such as Marine Polytrol. It works by penetrating deep into the gelcoat, restoring the lost shine and pigment, and providing a tough, durable finish. The finish, previously dulled and chalky thanks to the marine elements will be rejuvenated, looking great and giving you great satisfaction as a boat owner. Sometimes, you may not be as lucky and may need to strip the gelcoat back to the bare hull. This could be due to the layers of paint accumulating over a few years. There will be indicators that it is time to take this course of action such as; water being trapped under the paint, therefore, causing blisters, patches of paint flaking away and creating a sort of cratered effect. If it is in a bad way, it is indeed time to start from scratch. This requires removing the paint. While you can hire a professional to complete this, the most cost-effective option is for people to do this job themselves. Scraping is an option but is a choice that will require a lot of time and a lot of work. An alternative that will cause a lot less hassle is to use a chemical stripper. Now, you can’t just use an ordinary paint stripper for the task. The product has to be suitable and safe for use on glass reinforced plastic surfaces (GRP), commonly known as fiberglass. Marine Strip is a readily available product that can be used to aid the paint removal process. After applying the stripper, it gets to work after a few hours, softening the top layers of the paint work. Within 12 hours, the paint will be simple to remove through the use of a pressure washer and a brush. It is a lot less labor intensive to use a chemical stripper than it is to scrape off the paintwork, with no chemical assistance. It could also lead to unintentional scratches and damage to the underlying gel coat. With the use of a product like Marine Strip, it takes some of the work required away as it can be applied and left overnight to work its magic, removed the next day. It is also a cheaper alternative than paying somebody else to complete the work for you. The marine environment will at times cause your gelcoat to look tired and in need of revival. Rest assured, there are options available to give it that new lease of life which will restore your enthusiasm in the process. I have a 1980 30’S-2 sailboat the previous owner painted the boat from the water line to the toe rail with a navy blue oil based rostolium top side paint. It’s very dull and we don’t like it. We want to repaint the boat. I will do it myself in the boatyard outside. What is the product you suggest to strip the paint without damaging the gel coat. We would recommend you use Owatrol Marine Strip on your sailboat. Marine Strip is a powerful water-soluble paint and anti-fouling stripper designed for marine uses which can remove up to 8 coats in just one application. It is perfect for use on boat gelcoats as it’s gel consistency means no drips, even on vertical surfaces. I hope this answer was helpful.